A new course in Nanofabrication and Nanocharacterization was developed and offered for the first time in Spring 2017. This course is intended for first year graduate students interested in the experimental practice of nanotechnology. In the context of a hands-on laboratory experience, students gain familiarity with both top-down and bottom-up fabrication and characterization technologies. This is achieved through the realization of a variety of micro- and nanoscale structures and devices that can exhibit either classical or quantum effects at the small scale. Although concepts relevant to the laboratories are emphasized in lecture, it is expected that students will already have been exposed to many of the underlying theoretical concepts of nanotechnology in previous courses. It is our intention to offer this course on a yearly, ongoing basis. Topics include optical and electron-beam lithography, physical vapor deposition, chemical and plasma etching, self-assembly, quantum dots, and electron microscope and scanning probe characterization techniques. These technologies will be exploited to fabricate and characterize micro- and nanodevices and systems including graphene-based electronic transistors, phase-separated block copolymers, quantum dot systems, microelectromechanical systems, and microfluidic devices. These images depict 4 devices and materials that students fabricated or synthesized in ESE 536, and are attended to illustrate the four quadrants (top-down vs. bottom up; classical vs. quantum) of nanotechnology. 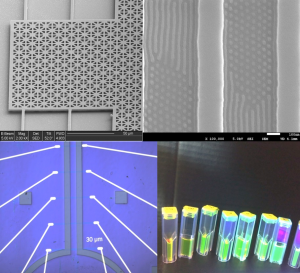 From the top left in a clockwise direction: A MEMS device representing top-down synthesis and classical description of physical properties; a patterned Si surface coated with a block copolymer demonstrating directed self-assembly and representing bottom-up synthesis and a quasi-classical physical description; CdSe quantum dots, representing bottom-up synthesis and requiring a quantum mechanical description of the properties; graphene transistors under a microfluidic channel representing top-down fabrication and a quantum mechanical description.